Donald Trump rescues Ed McMahon from foreclosure! The Donald to the Rescue — Trump will buy McMahon’s Beverly Hills house and let the aging McMahon stay in the house — rescuing McMahon from a looming foreclosure date that would have evicted him from his $4.6 million Beverly Hills home. My comment: You know times are tough when the man who used to hand out million dollar checks is having trouble paying his bills! 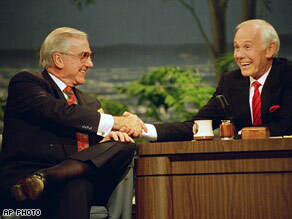 The foreclosure problems sweeping the United States apparently have ensnared Ed McMahon, who is best known as Johnny Carson’s sidekick on “The Tonight Show.” The Wall Street Journal reported Tuesday that McMahon was $644,000 in arrears on a $4.8 million loan for a home in Beverly Hills, California.